By the author of With My Knife and Dragonfox. 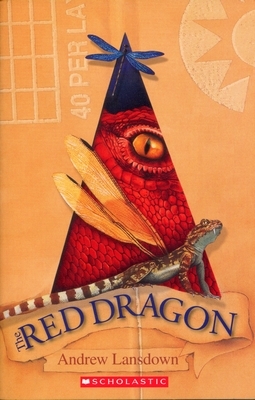 In 2007, the Children’s Book Council of Australia (CBCA) declared The Red Dragon to be a Notable Australian Children’s Book (Young Readers category). The Red Dragon by Andrew Lansdown is the book that I have been reading over these two weeks or so. This book’s main genre is fantasy. This book is mainly about Colyn (the main character) who has been forbidden to return to the otherworld of Klarin, where the Dragons and Kinroan live. Colyn is very upset and disheartened because of his banishment from the otherworld of Klarin but then as if sent from God a dragonette comes to him to comfort and help him through from Klarin. The dragonette comes into his world and helps him out and then eventually into his heart, as he falls in love with it. The dragonette also prepares Colyn for his strange and dangerous visitor also from the other world. This leads to a large battle taking place in the otherworld. This book, in my opinion is a good book for younger high school students such as Years 8 and 9. It is a quite interesting book and very enchanting with all the dragons and other various mystical creatures. The story line is also interesting and not one too boring or dull. I think that it is quite a good book and would be a good investment for any school to buy for a class to read. As I said before I think that it is more aimed at a younger audience but Year 10 students may also enjoy it. In conclusion I think that The Red Dragon has a good story line and interesting to read. A terrifying battle in the otherworld. Colyn slipped his hand inside his shirt to touch the scar below his collarbone. The wound from the dragon’s tusk had healed up well, although it was still slightly tender. But the wound to his mind had not so easily healed…He would wake in a sweat, reaching frantically beneath his pillow for his knife. Colyn, the Rykone, bears the Kinrye knife of Klarin – the other-world where dragons are feared and slain. Stuck back in his own world, Colyn, longing for the adventure of Klarin, cuts a window between the worlds with his treasured knife and lures a small dragonette and, even worse, a rare red dragon, through to his world causing trouble in both worlds. This is a gripping fantasy full of excitement, adventure and betrayal. While older readers might long for more, it is still a satisfying read peppered with lovable characters. Aussierevies.com – Reviewing the best of Australian books, films, music websites and more. Colyn jumped at the sound of his father’s voice and jerked his right hand behind his back. ‘I … er … nothing,’ he stammered, dropping his gaze to the shed floor. His father propped his shotgun against the wall and leant against the wall himself, hands in pockets. Colyn waited, not daring to look up. He could feel his face burning. Colyn looked up and parted his lips to speak, then stopped. Slowly, he took his hand from behind his back and opened his fingers to show what he had been hiding. Colyn passed it to him and stepped back. His father turned the object over in his hand. It was a small stone disc with a triangular hole cut in the middle of it. He lifted it to his eye and peered through. ‘It’s just a window-stone,’ Colyn said lamely. ‘I thought I told you not to go making any more doors,’ his father said, lowering the stone from his eye and fixing his gaze once more on Colyn. Without thinking, he turned the disc over in his hand, feeling its shape and texture. His father flung the disc to the cement floor, shattering it. Fragments of stone spun in a dozen directions. One hit Kinzar in the ear and made him yelp. Colyn hung his head and fingered the handle of the knife in his belt. He clicked his thumbnail across the lines of the triangle etched in the wood. Colyn slipped his hand inside his shirt to touch the scar below his collarbone. The wound from the dragon’s tusk had healed up well, although it was still slightly tender. But the wound to his mind had not been so easily healed. Even though almost four months had passed, he still had nightmares of the attack. He would see the dragon swing round to gore him again. Or he would feel himself hurtling through the air, tossed from the dragon’s tusk like a wad of hay from a pitchfork. And he would wake in a sweat, reaching frantically beneath his pillow for his knife. ‘It doesn’t hurt any more,’ Colyn said, pressing the scar gently. ‘And what would you do with two Dragon Knives?’ his father asked. He stood up and half smiled. ‘It seems to me that one gets you into enough trouble! ‘I’ll come with you,’ Colyn said. ‘That wouldn’t make any difference to me,’ Colyn interrupted. After watching his father trudge down the gravel road with Kinzar in tow, Colyn selected a large potato from a sack in the shed, then set out himself. He headed across the potato paddock for the river, making his way to a place where a tree long ago had toppled into the water. It was his special place and he never grew tired of it. The great weathered trunk sloped gently from the riverbank to the middle of the riverbed. Using one of the twisted roots for a step, he clambered onto it. He paused to rub his toe on the flat spot where he had once carved, then scraped off, the letters of his name. ‘COLYN LARKIN,’ he said out loud, reading the letters that were no longer there. He walked out to where a heron had left the nippers and head of a marron, a freshwater crayfish. The shell had turned a bluish colour in the sun. He brushed it off and sat down. And immediately he began to argue with himself. He looked around—not to take in the beauty of his surroundings, as he usually did, but to make sure no one was watching him. Then quickly he drew his knife and, without as much as an admiring glance at its curved blade or its engraved handle, cut a slice from the potato. He hesitated and looked around again. Sensing no danger, he stabbed the knife through the potato slice and cut a triangular hole in it. Then he peeled the slice. As the last strip of peel fell away, the potato turned to stone, a stone with a window in it, a window-stone. Standing up again, he lifted the circular stone to his eye and peered cautiously through the triangular window. Although the sun blazed about him, all he could see was mist. One mist—many mists—white and swirling. The sight was a familiar shock, an unfading fascination. He lowered the stone and looked at the sunlit landscape. He saw trees on the riverbank, pools in the riverbed, ducks and herons in the pools. They did not interest him. He lifted the window-stone to his eye again. The mists twirled and twisted about one another. It was as if an Arabian woman were dancing with white silk scarves, dancing so skilfully that she kept herself entirely hidden. He stood spellbound, losing all sense of time, like someone peeping through a keyhole into a forbidden room. He was hardly aware that he was hoping to see—and dreading to see—a dragon in the white shadows. Or at least, the fiery yellow of a dragon’s eye. The knuckles of his knife-hand turned pale as he unconsciously clenched the weapon the dragons had made and lost, the Kinrye they coveted and feared. The blast of a shotgun startled him from his trance, unsettling his balance. As he threw his arms out to steady himself, the window-stone slipped from his fingers, bounced on the log and toppled to the ground. ‘Blow!’ he said, remembering in the nick of time not to swear. He spun around to face the riverbank. His father was not there. Relieved, he slipped his knife through his belt and scrambled off the log. As he stepped into the bracken at the edge of the potato paddock, he spied his father and Kinzar barely a hundred metres away. His father waved his hat. Kinzar barked and came at him fast. ‘Did you find the den?’ Colyn asked, pushing Kinzar away for the tenth time. ‘What’s for lunch?’ Colyn asked, taking the gun. First published 2006. Reprinted 2007. Click here to open a downloadable pdf of the first chapter of The Red Dragon.